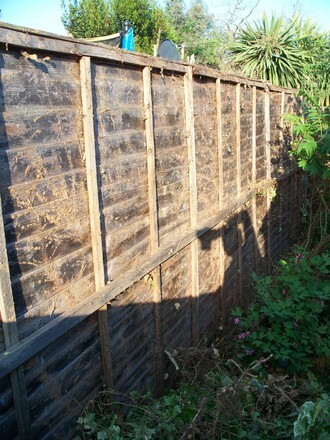 Now all the ivy is down and fence is near as damit clear I can’t help feeling that i’ve gone backwards with the garden. Just doesn’t look or feel like my lovely garden anymore. I even went out the front tonight to have a ciggie as didn’t want to look at it. On next neighbours side the roots was so thick and attached like glue to the fence it just didn’t want to come off. 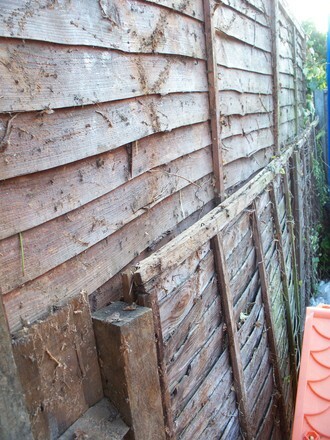 But I got them off and cleared her fence in the end and is now down the side of her garden ready for the tip!! Sure it’ll turn out just fine once i’ve painted it and removed most of the dead leaves. How fast do leaves mulch if i was to cover them in compost? 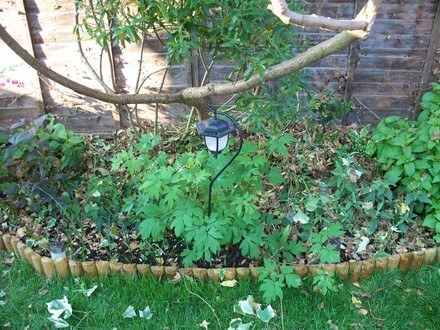 Also in 2 minds wether to lose the staghorn and replace with acer tree! What do you think guys? Next post: Where did the day go? Aww thanks for that Sandra. Feel a little better now. 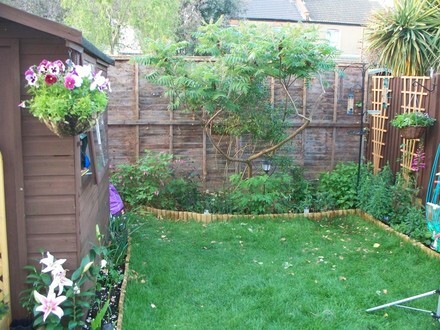 Hopefully when fence had a recoat and clematis's & other climbers are on the fence then should feel a whole lot better. I haven't got an acer to lose just a staghorn or is that an acer in between the staghorn?. It's always heart wrenching when you have to cut down something that has just outgrown it's space in the garden, tree; shrub or even the ivy. That's gardening - always evolving! Your garden's looking good. Well done on getting rid of all the ivy. It will look bare for a while but just think of all the new plants you can put there ,so when you have your ciggie you can be planning your new garden look. I know what your saying Dee as your eye just goes straight to the worst bit. Wish it didn't. lol. 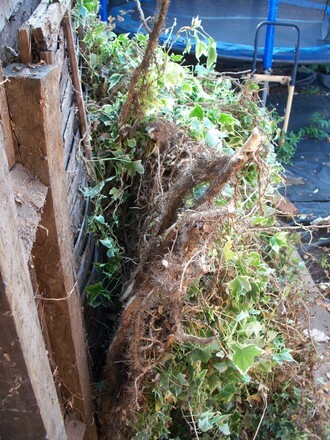 Feel better about it today as all the ivy has gone and is now rotting down the tip. Feel like i'm getting my garden back a bit. Going to paint it at the weekend and add more compost to the back around the plants so should look a lot better. Were giving the Staghorn this Summer/Autumn to see what it looks like and if it fits with the rest of the garden. Got all new red horns & leaves coming through now. I've trimmed it right back as it was blocking the view to bird feeder & hanging basket ,access to composter and also getting in the way when mowing the lawn. Looks better now. Looking forward to seeing your pic with bamboo screening. 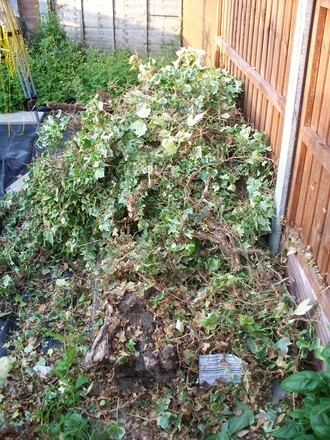 I wasn't sad to be getting rid of Ivy Peonyrose, just the mess & havoc its left behind. TT, can you not just keep it trimmed at the top on your side or is it hard to gain access? Going to the nusery on Saturday to see what is about. Be doing evergreen or clematis's probably. It might not look very good now but gardens are things that grow and deveop. It won't stay like that for ever. Later on after you've planted new things and they start to grow, you'll be wondering why you felt so disheartened. Well done on what you have achieved and I know it will look completely different once you have your new plans in action. I have a problem in my small garden with a plant called mile a minute which is in the privet hedge and looks so unsightly. It isn't ours I might say or it would have been uprooted years ago!! I'll feel fine once that fence has been painted and new plants are in!